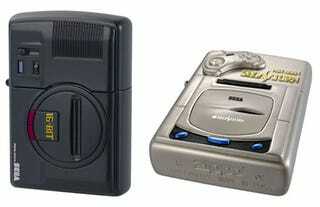 Any Sega fan worth his or her salt would gladly take up smoking and/or arson as a passion, now that lighter maker Zippo is making Sega Genesis and Sega Saturn lighters in collaboration with Banpresto. Don't expect to see too many of these classic Sega consoles lighting up butts. They're only available for order until November 6 and for the steep asking price of 10500 yen, about $114 USD, each. Of course, if you light your cigars with hundred dollar bills anyway, we're sure you won't mind dropping that much on a Sega lighter.